Here is a first novel by an indie author (aka self-published to some) that is a pure delight to read–well-written, well-edited, professional cover. This is a book you can pick up and compare to the product of a traditional publisher and not see a difference. 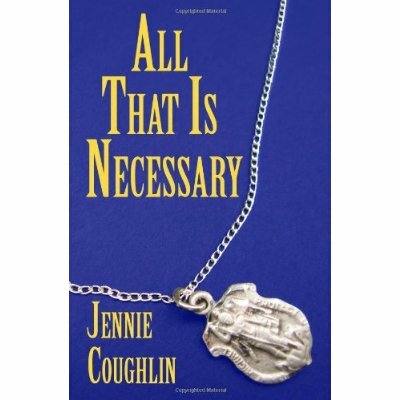 I’ll add here that the author, Jennie Coughlin, is a friend of mine and that I’m a member of the critique group that went over All That Is Necessary. However, she did not ask me to review her work, and despite the fact that I’ve seen its various iterations in our critique group, I did purchase a copy at full price. I have an advantage over the average reader of this book: I know there are more novels to come. That doesn’t prevent this novel from standing alone. It can and does, though if you don’t know there is more to come, you might consider the ending abrupt and unsatisfying. Resist that impulse. The book opens with a commonplace event. A former resident, who left as a boy, returns to take a job at the local high school, an event that sends ripples of unrest among a trio of close friends: Dan Reilly, his best friend Evan Czarnecki, and Evan’s wife Liz, who is also Dan’s cousin. In fact, the return of this prodigal son sets the whole small town of Exeter on its collective ear. Some twenty years before Dan and Evan literally saved Exeter from being taken over by the Irish Mob, and though Dan had some physical injuries as a result, the most grievously hurt was young Rick Murray, whose father turned out to be a mob enforcer. Murray has returned to Exeter to accept the job at the high school, and the town and indeed Murray himself aren’t sure why. Misunderstandings and miscues ensue. Feelings are ruffled to angsty heights. Friendships of long standing come into question. An old recording of a beloved, martyred uncle throws an entire life into question. A marriage suffers a communication breakdown. Assumptions of innocence fall by the wayside. And the Irish Mob may be headed back to Exeter, but by a route no one anticipates until perhaps it’s too late. Most of these characters we’ve seen before, in Coughlin’s debut book, a collection of Exeter short stories entitled Thrown Out; so there is immediate familiarity. We see more of the fictional Exeter, Massachusetts, as well, and we get a real sense of walking its streets, visiting its shops, and chatting with its citizens. We get a chilling glimpse into the inner workings of the Irish Mob as well, of the deep yet misplaced loyalty to “The Boss,” a thinly veiled allusion to the now imprisoned Whitey Bulger. The scene where a father explains to his son exactly what his mob tattoo means is spine-tingling in the offhand way the father relates its meaning. We also get a glimpse into the life of a married couple who suddenly have trouble communicating, as a direct result of Rick Murray’s return. We see the stubborn recalcitrance of one spouse and the patient waiting of the other, and we envy the closeness and openness of their relationship. Oh, and they happen to be gay. Coughlin has made a powerful social statement, whether intended or not, about the normalcy of gay relationships and has integrated that relationship seamlessly into her story. When we contrast it with the other married couple in the story–Evan and Liz Czarnecki–we see there is no contrast at all. Marriage is the same, regardless of the participants. This is a complex, multi-layered plot, with subtleties that pop up days or weeks after finishing the book, and Coughlin also includes in her novel another of her loves, historical preservation. The restoration and re-purposing of an old mill near Exeter becomes a central aspect of the plot–and the books to follow. That makes Exeter a common, New England town, one which had its heyday at the height of textile-making in the northeast and one which almost fell to total decline as mill after mill closed. There are plans for the old mill in Exeter–one which will take it toward a bright future, and another which could drag it back to its mob-laden past. Believable characters, an intricate plot, an absence of fluff, a thread of social justice, and the anticipation of more plot twists to come, All That Is Necessary will challenge you to keep up, and you’ll keep turning the pages to do just that. So, stroll the streets of Exeter along with its citizens, but keep a careful eye out for the Celtic Cross-tattooed guy lurking in an alley. A great book makes a review easy. Thanks.